Cold weather, short days, and dragging work weeks require comfort food in my book. And there’s no better way to hit the re-set on your dreary winter rotation than to spend a Sunday holed up in the kitchen making some comfort food. While me may have different versions of what comforts us when we’re under the weather, homesick, or had a rough day, we can all agree that some foods take us back to a memory, make us feel cozy, and sate our cravings. I’ve been traveling for work for three of the last four weeks, eating soggy salads wherever I can find them and dreaming about returning to my bed and my kitchen. It’s really tough to eat healthy when I’m on the road. Eating out for most of us is a real treat, or at least it always was for me. I would save up all week for a weekend splurge and then order the most indulgent item on the menu, think chicken and waffle sandwich with poutine fries. In an attempt to avoid the paunch and facial hair characteristic of my position, I’ve learned the hard way that I can’t splurge when I’m eating out while traveling. I can’t tell you how much it pains me to order a salad when the guy at the adjacent table has cheese sauce dripping from his chin and burger. I’ve been trying to manage this new lifestyle for over a year, and while I wish I could say it’s gotten easier, my envy hasn’t abated. I mitigate the foodie pain by making healthy versions of the dishes I pass up in restaurants during the week. I replace hamburger with a juicy, well-seasoned portabella mushroom and sandwich it between a sprouted grain bun. 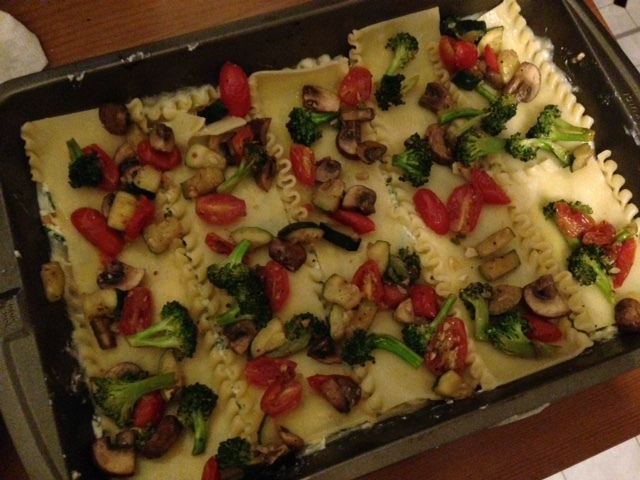 I lighten up one of my favorite comfort foods, pasta, with lots of veggies and sometimes even gluten-free noodles. Any foodie worth his or her weight has read at least an article or two about the gazillion ways one can transform cauliflower into all manner of delicious pseudo-treats. Buffalo wings…made from cauliflower florets! 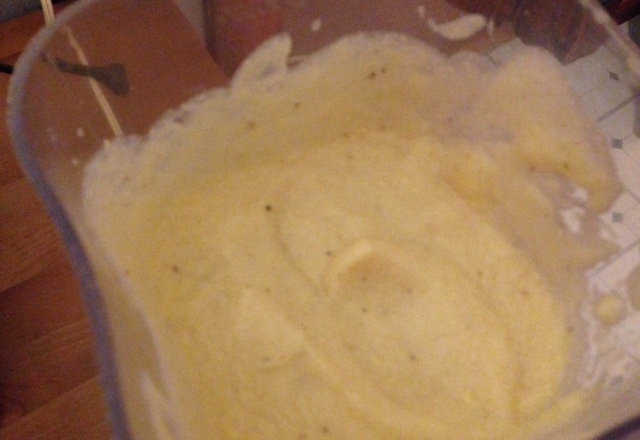 Pizza crust…pureed cauliflower!! Fried rice…again, cauliflower!!! I’ll admit to trying more alternative cauliflower recipes than any one person should, but I’m here to share with you one of the best. That’s right, I’ve eaten cauliflower pizza so you don’t have to. 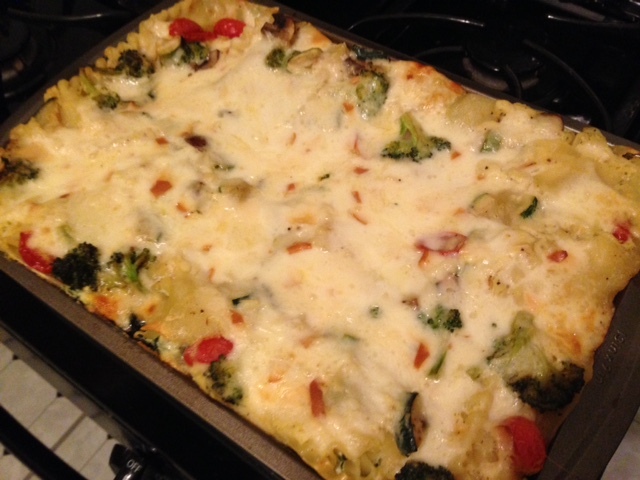 This Cauliflower Cream Veggie Lasagna checks all of the boxes. Healthy, check. Creamy, check. Comforting, check. It’s a light indulgence when you just need a damn plate of pasta and glass of wine after a long week. It has seven different kinds of veggies, and the creamy, cheesy Alfredo-like sauce between each layer of lasagna noodle is made from cauliflower. Rejoice! And then make this recipe. And then rejoice again. PS: if you make a full pan of this stuff, all of your workdays will be made significantly happier with the addition of leftovers. 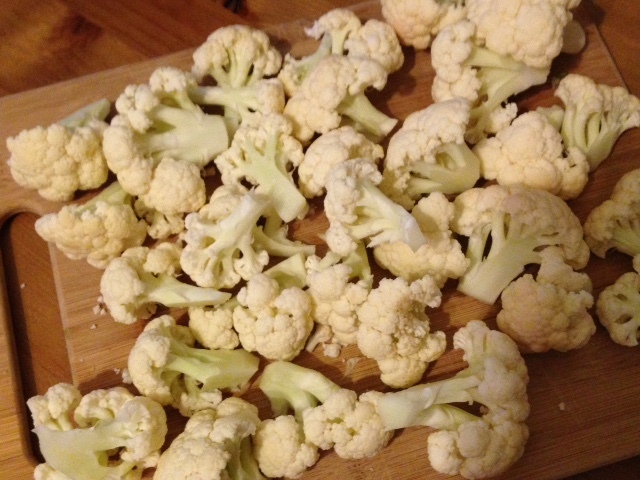 Place chopped cauliflower in a large pot and cover with 2 inches of water. 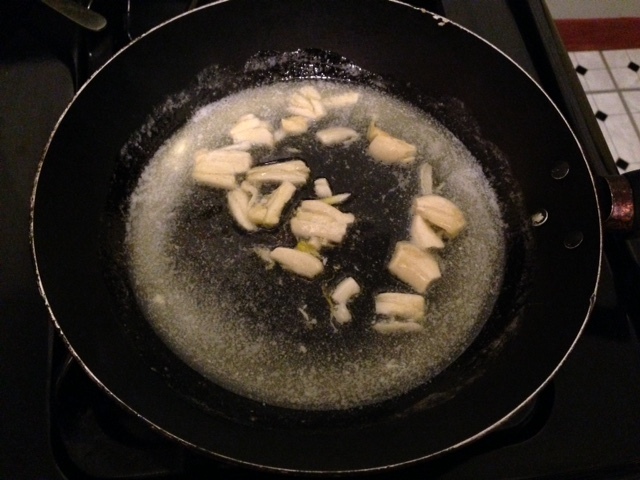 Bring to a boil and cook until the cauliflower is fork tender, about 10-15 minutes. While waiting for the cauliflower to cook, peel and smash with the back of a knife six small cloves of garlic and place in a small sauté pan with the butter. Cook on low heat until the garlic smells fragrant, about 2-3 minutes. Be careful not to burn the butter or the garlic. Take the cauliflower off the heat and drain. Rinse with cold water to cool down before transferring to the blender. Combine the rest of the sauce ingredients in the blender and pulse until the mixture is smooth and creamy. 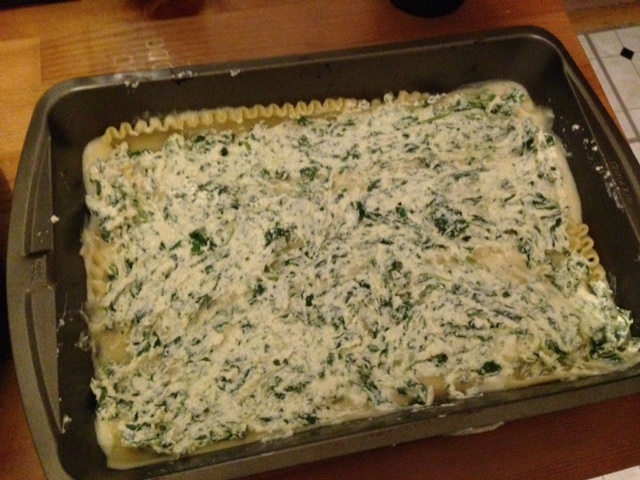 Set aside until ready to assemble the lasagna. 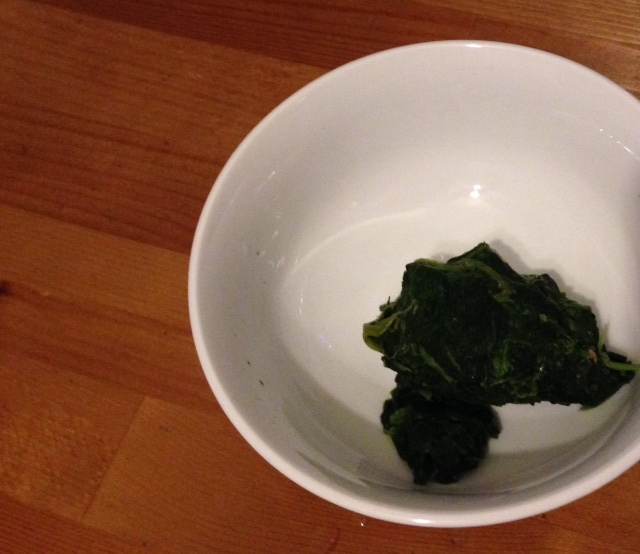 Once the frozen spinach has thawed, squeeze it with your hand until you’ve released all of the excess moisture. 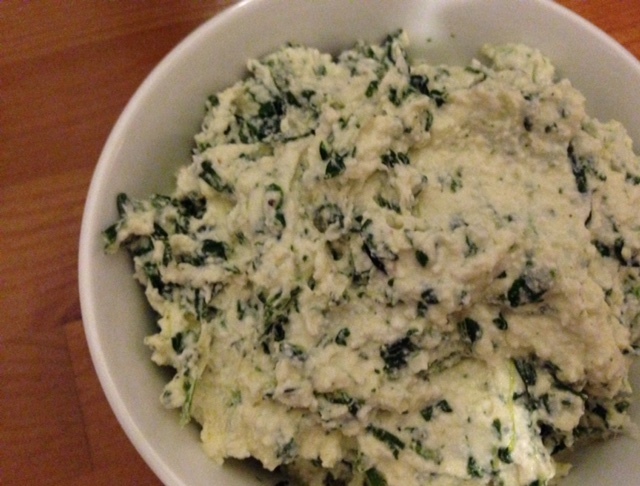 Combine the lightly beaten eggs, spinach, and Parmesan cheese with the ricotta and mix until smooth. Season with the salt and pepper. Refrigerate until ready to assemble the lasagna. 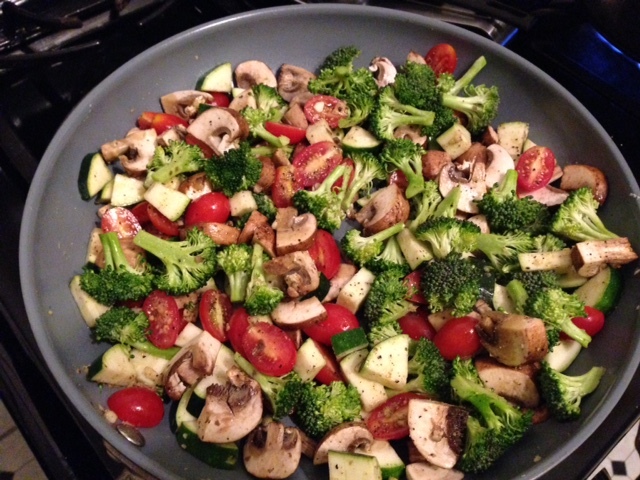 Combine chopped vegetables in a large sauté pan with 1 tablespoons olive oil and salt and pepper. Cook over medium heat until the mushrooms have given up their moisture and the veggies are tender, about 10 minutes. Boil the lasagna noodles in a large pot of salted water until al dente, about 8-9 minutes. 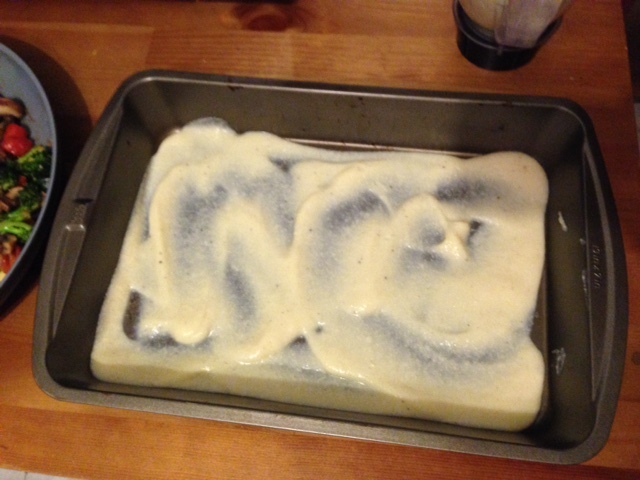 You want them to be pliable, but not cooked all the way through as they’ll continue cooking in the oven. Drain and drizzle with a teaspoon of olive oil to prevent the noodles from sticking. 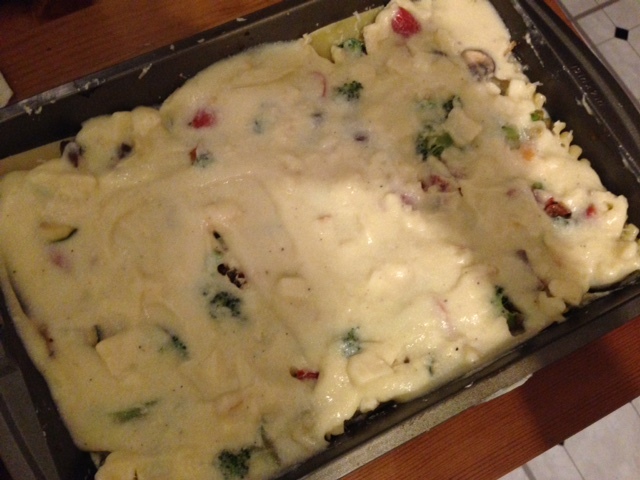 Begin assembling the lasagna by covering the bottom of a 9 x 13 inch pan with a light layer of the cauliflower sauce. Next lay down a layer of noodles. You may need to cut your noodles to ensure even coverage depending on the size of the pan. Cover the noodles with half of the ricotta cheese mixture. Next lay down a layer of noodles but arrange them in the opposite direction. If your first layer was horizontal, lay the next ones vertically. This will ensure a more firm, compact lasagna when you cut it. Cover the noodles with half the veggie mixture, half of the shredded cheese, and half of the remaining cauliflower sauce, and then repeat with another layer of noodles. Repeat with the remaining ricotta, another layer of noodles, and finally, the rest of the veggie mixture, cheese, and cauliflower sauce Make sure the sauce covers all of the noodles, otherwise the exposed parts will get too crispy when cooking. Cover the lasagna with foil and bake for 45 minutes. 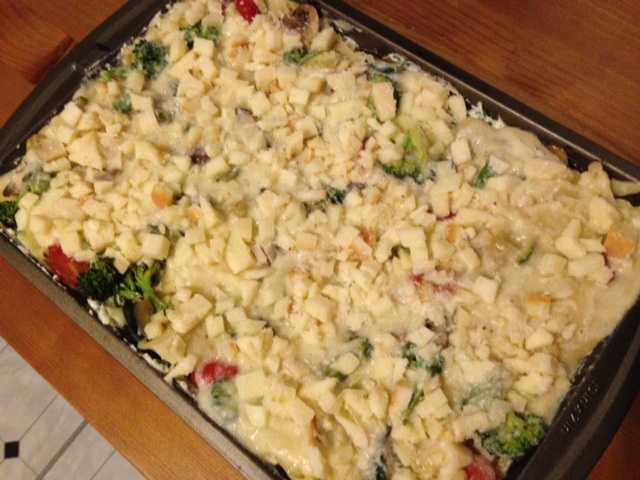 Remove the foil and cook for an additional 15 minutes until the top is slightly crispy and the cheese has browned in places. Let cool 10 minutes before slicing and serving. Hi, I’m Amy. Cooking nourishes my soul. I love to whip up organic, plant-based, whole food dishes, but I’ve also been known to walk a mile in a blizzard for fried chicken at lunchtime. Join me as I hunt for balance between nutritious and delicious, sharing my love through food, one meal at a time. 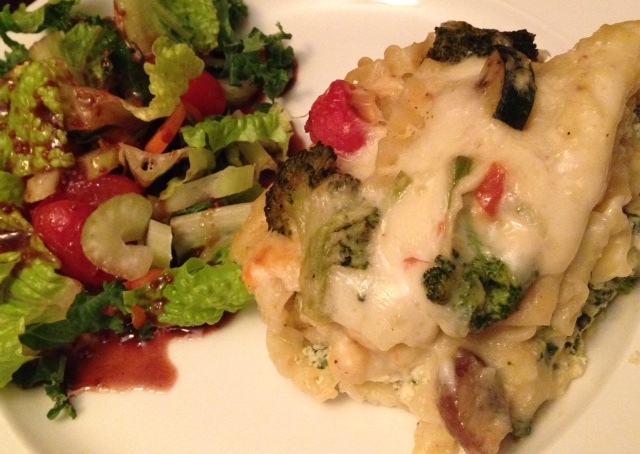 Do you want FREE RECIPES from Amy sent straight to your email? Subscribe now!